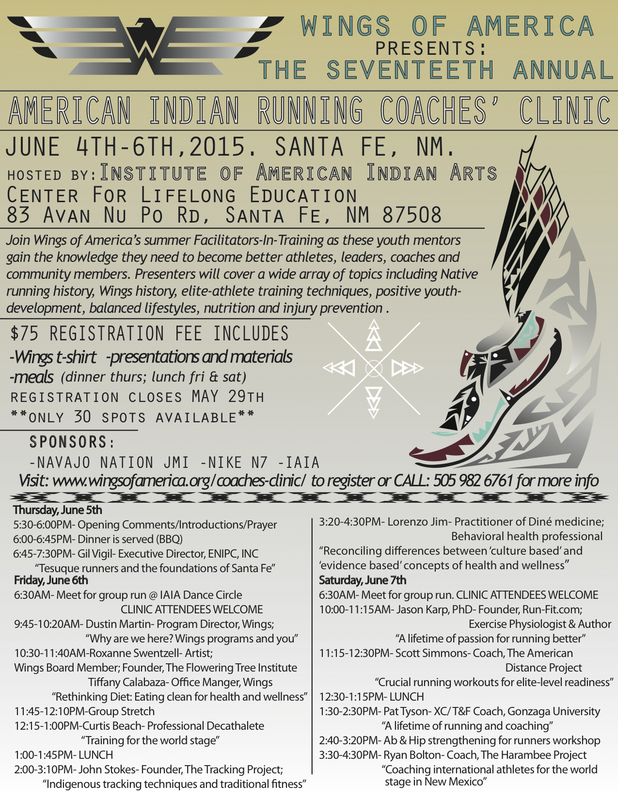 In just one month, student-athletes from all over the U.S. will convene at the Institute for American Indian Arts in Santa Fe to participate in the 17th annual “Indian Running” Coaches’ Clinic. As in years past, this 3-day forum will function as the first part of job training for the young men and women who will serve as facilitators for Wings’ summer Running & Fitness camps from early June until early August. 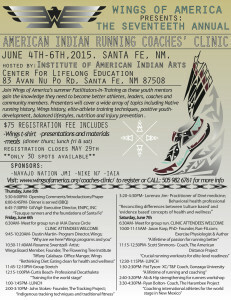 With speakers presenting on everything from Native running history to the benefits of anaerobic workouts for endurance athletes, Wings organizes this conference-style event with hopes of giving student-athletes the inspiration and knowledge they need to become better athletes, mentors, community members and coaches. A limited number of spots are available each year for interested community members and area coaches. “Tuition” is only $75.00 and includes all clinic presentations and materials, a Wings t-shirt and a meal on each of the three days. Please join us for what is sure to be an enlightening and inspiring few days for anyone interested in the sport of running. Download the official clinic flyer and schedule below and visit the Wings website to register.